That sounds very cool!!! Excited for the next mods! Your mods Abutre and Miss America are a lot of fun! Ladies and gentlemen, Secret Mod 2 has been released. To locate the hidden chamber of The Crypt, go to the first post and locate the ?????. Bear in mind that Secret Mod 2 used to be Stan Lee, but to celebrate his life and legacy, that mod is not a secret anymore. So this one is very different, and the password is not the same. Can you discover who it is? Much appreciated, amigo. I'm assuming you meant Vulture and I'm glad you're enjoying them. Of all the character's to get a mod, I was not expecting that character's sibling to get a mod. Nice job Outsider. Dope new mod!! this all villians version is gonna be tight! Thanks!! 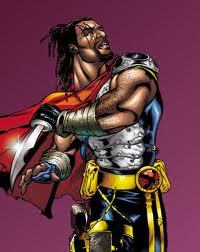 So, I will very soon work on my next project -- Skurge. In MUA, he is known as the Executioner, but he has since been reformed, and was even deemed worthy to enter Valhalla. Since he is already in the game, his mod should be easy enough. Now after him... the choice is up to you! Ooh, I'm not sure who to vote for! They all sound so cool! Interesting! I have ideas on who the first, third and fifth options could be, should they be Marvel characters. If so, the first could be especially cool. If your talking about who I think for a powerful hero. Then people please vote on a powerful hero. The fact that he's black has already held him back enough ( in the comics I mean ) Probably left him a little blue. it would be the ultimate turn around for this character. Anyway outsider thank you for everything you have done, and continue to do. You bring joy with your work and you will be missed if you o ever decide to quit. I say go till you pass Lego if that make since. Anyway what do you guys think of MUA 3? Would you buy a Nintendo just to play it? You forget to mention how marvelous it would be to avenge as such a mighty hero. Those of you who haven't voted yet... you've still got time. Good to hear that you're enjoying the newest Secret Mod, and that the password wasn't too hard to figure out. If your talking about who I think for a powerful hero. Then people please vote on a powerful hero. The fact that he's black has already held him back enough ( in the comics I mean ) Probably left him a little blue. it would be the ultimate turn around for this character. Well, it appears you all have a certain theory on who one of them is... Just note that a couple of the picks are not from Marvel. Can't tell you which ones, though. Anyway outsider thank you for everything you have done, and continue to do. You bring joy with your work and you will be missed if you o ever decide to quit. I say go till you pass Lego if that make since. Anyway what do you guys think of MUA 3? Would you buy a Nintendo just to play it? I appreciate those words. I can't keep going after this year though, as the CCC only has but a number of spaces, and I don't want to take them all. Plus, I think it would considered overkill. Gotta let other modders shine. As for MUA3, I think it's annoying that it's a Nintendo exclusive, and no, it doesn't warrant my wanting to buy a Nintendo Switch. I'm not into the childish games they tend to offer, as it seems like every other game they have is Mario this and Pokemon that. I'm sure those kinds of games are fun in social gatherings, but it doesn't interest me particularly. Yeah, I'm thinking the same thing as jampak and Jaybird indeed. But isn't it a bit sad in a way that we're all thinking the same, based on the description of 'a very powerful black hero'? It shows that there aren't enough of those! But on that note, I mainly know the suspect from a certain series by writer Al Ewing, where I only realised after several issues that he built up an almost entirely black cast out of all the options from the Marvel Universe, and it wasn't even especially noticable as the team came together dynamically & it didn't make an explicit point out of it. I liked that. Another Asgardian of The Galaxy comin' through! Here comes the reformed axe-wielding Executioner also known as Skurge. He has rather simple yet punishing moves that are very accurate of his character. It'll be fun for you. For them? ...Not so much. Go on, check him out. -Abilities of Might, Poison Immunity, and Wielder Speed (moves twice as fast when wielding weapons). -Uses his in-game skin, HUD, and sounds/voice. -1 skin & HUD, loading screen, icons, mannequin, and sound files. -Uses official number #62 (clashes with Sub-Zero and Hellcat at mannequin). 1. Hard Bash: Swings his axe at an enemy, causing them to be temporarily stunned. 2. Barbaric Blitz: Swings his enchanted axe three times, ending with a forceful thrust. 3. Skornheimian Dash: Charges forward destroying everything and everyone out of his way. 4. Executioner's Might: Swings his enchanted axe so forcefully that it gets stuck in the ground briefly. Inflicts heavy damage. 5. (Boost) For Asgard...: The team gains extra attack damage for a time. 6. (Boost) Health Recovery: Recovers some of his health. 7. (Xtreme) Pure Execution: Charges his axe with fire, then he slams it on the ground, releasing a blast of flame on all enemies. Outsider - Mod creation & coding, MCU HUD, loading screen, icons, sounds, hex-editing etc. The "Wielder Speed" ability was not an intended one, as in the game, Executioner moves very slowly, so I had to speed him up. Awesome! Looking forward to running Enchantress/Skurge in a team now!